How can I see what ports are open on my machine? I would like to see what ports are open on my machine, e.g. what ports my machine is listening on. E.g. port 80 if I have installed a web server, and so on. Is there any command for this? If you later want to make sure that the only thing you allow through your firewall is port 80 I often use ShieldsUp from www.grc.com to perform a firewall test. To list open ports use the netstat command. In the above example three services are bound to the loopback address. IPv4 services bound to the loopback address "127.0.0.1" are only available on the local machine. The equivalent loopback address for IPv6 is "::1". The IPv4 address "0.0.0.0" means "any IP address", which would mean that other machines could potentially connect to any of the locally configured network interfaces on the specific port. For more details see man netstat or man lsof. sudo iptables -L will list the port rules for your pc. Note that if you are using ufw or shorewall firewalls the output maybe be hard to read. In that case rather use sudo ufw status for example. This is not very useful on its own as even if a port is open access will still be denied if there is no process listening on that port. 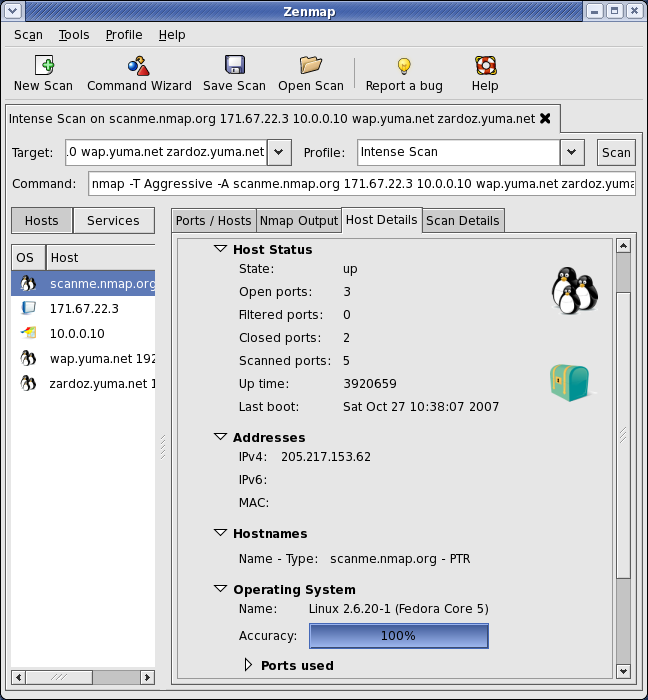 Zenmap is the official graphical user interface (GUI) for the Nmap Security Scanner. Not the answer you're looking for? Browse other questions tagged networking server or ask your own question. How do I see which ports are open? How to check opened/closed ports on my computer? Is it possible to search for a keylogger using netstat / nmap? Why do these errors appear while running fake run-fake-gps.sh? Are my standard Ubuntu open network ports at risk??? Could I use port 8080 - 8100 (if they aren't in use)? Are open ports fair game? Test to see if a port on a network is open?